[The Committee] accepts the Study identifying approximately 2,146 acres within the unincorporated municipal service area (UMSA), which lie entirely in Commission District 9 represented by Commissioner Dennis C. Moss, to be slum and blighted. 5. The Board directs the County Mayor or the County Mayor’s designee to prepare a plan of redevelopment for the Area, and to submit the plan of redevelopment to the Board for approval after notice and public hearing. Should a community redevelopment agency be created, the Area covered will make it the second largest in the County, with only the North Miami Community Redevelopment Agency larger at 3,540 acres. The Study includes the Zoo Miami, Coast Guard, and the former University of Miami properties. The goal in establishing the existence of slum or blight conditions and subsequent community redevelopment agency (CRA) is to create a special tax district¹ which will channel public funds into development of the site. The development in question is the $930 million theme park, Miami Wilds. As I have written previously the construction of this theme park (in its present incarnation) is a serious and unacceptable threat to the Richmond Heights pine rocklands and the survival of numerous endangered species, including the Miami tiger beetle, a candidate for emergency state and federal protection. The developers, Miami Wilds LLC, have already received approval for an initial $13.5 million in bond funds to replicate the US Coast Guard communications tower array which currently stands in the footprint of the theme park. However, use of this land requires Federal permission and approval of the developer’s plans; approval which has not yet been given. The Richmond Heights pine rocklands have survived comparatively unscathed since the since the early development of the site in the 1940s and these lands represent a major portion of the 1.8% of pine rocklands left outside the Everglades National Park. Any further development seriously jeopardizes the rocklands, chiefly by fragmenting the remaining habitat and stifling fires, a necessary ecological cycle for the continued health of the habitats. These current plans for Miami Wilds and Coral Reef Commons will severely fragment the remaining Richmond Heights pine rocklands. Once these rocklands are surrounded by heavy development any prescribed burning will be extraordinarily unlikely. A secondary impact of any development is that without sufficient buffer areas around the rocklands the new fragments will be highly susceptible to pollution and encroachment of non-native and invasive animals and plants from the surrounding. The current plans for development do not adequately conserve these imperiled rocklands and are not a reasonable option for the continued survival of this unique habitat and its inhabitants. Over 98% of the Miami-Dade rocklands have been lost to development. There are better options for utilization of the non-rockland areas, options which do not fragment or destroy rocklands, alternatives which provide adequate buffers to facilitate the necessary management of the habitat. The “blight” resolution has been forwarded to the Board of County Commissioners for consideration and a full public hearing on January 21st. The Center for Biological Diversity has a letter to the Miami Board of County Commissioners which you can sign and send in support of preserving the pine rocklands. View the resolution here. Read the Calvin, Giordano & Associates study here. Also see the Miami Herald article on the this latest development. It is about five in the morning on a warm August day and I am sitting in the Richmond International airport. I am waiting to board a flight to Miami, Florida where I will be meeting up with Dr. Barry Knisley, researcher and authority on tiger beetles. 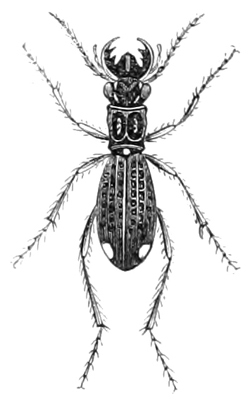 Florida is home to many species of tiger beetles including several endemic to the state. However, the habitats of a number of species are today threatened by urbanization or the development of land for agricultural use, particularly for Florida’s ubiquitous citrus crops. One of these endemic tiger beetles is the strikingly green-colored floridana form of the minute species Cicindela scabrosa. Differs from abdominalis in the shinning green color of head, thorax and elytra, the later with purplish reflections posteriorly at the sides, and in the strong deep punctures and fovea of the elytra. The green color will also separate this variety from the variety scabrosa Schaupp. Holotype and 20 paratypes collected at Miami, Florida, August 9-12, 1934, by Frank Young. Holotype deposited in the U.S. National Museum, paratypes in the collections of California Academy of Science, Museum of Comparative Zoology at Harvard, and in the private collections of F. N. Young, W. M. Gordon, M. A. Cazier, J. W. Angell and the author. Cicindela scabrosa var floridana is a member of a complex of closely related, small cicindelids. 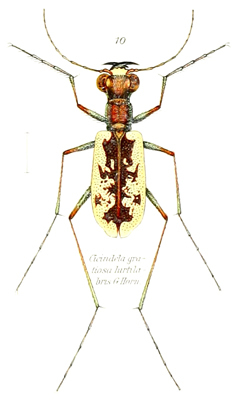 The archetypal species in this complex, which also includes C. highlandensis, is Cicindela abdominalis. There has long been much confusion over the relation between these species; at one point there were no less than three synonymous species names for both Cicindela abdominalis and C. scabrosa. 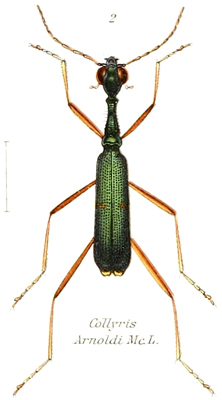 In his 1984 treatment of the Cicindela abdominalis complex, Choate elevated Cicindela scabrosa to a full species and placed Cicindela abdominalis floridana as a synonymy of Cicindela scabrosa, attributing the green color to be a sign of recent emergence. Years after his discovery of C. scabrosa var floridana, in communication with fellow entomologists, Young reported that he collected the specimens in the area surrounding Barry College. Unfortunately, this area, like so much of the neighboring region, had been heavily developed in the intervening time. Several researchers, including Knisley, surveyed numerous Miami-Dade county parks and area preserves for C. scabrosa var floridana but without success. An isolated population [of C. scabrosa] in the Miami area has been considered as a subspecies, C. scabrosa floridana Cartwright, which is smaller … and distinctly green above. This population … may now be extinct, probably because of habitat destruction and urbanization. And so with no suitable habitat remaining and no beetles seen since 1934, despite extensive surveys, this form was presumed to be extinct. But in September of 2007, over 70 years after this species had last been observed in the wild, a population of Cicindela scabrosa var floridana was rediscovered on privately-owned land in the greater Miami area. Jeff Slotten, a lepidopterist, happened across this population while surveying for butterflies and, being familiar with this species, was well aware of the significance of his discovery. He contacted Barry and a fellow tiger beetle enthusiast, David Brzoska; they set about surveying potential habitats and soon found another population at a directly adjacent site. The area upon which much of present-day Miami sits was once covered by pine rocklands. This fire-dependent community, found on limestone outcroppings, is comprised of a sparse canopy dominated by Florida slash pine, Pinus elliotti var. densa, and a varied understory which includes many endemic plant species. This habitat once stretched from the Florida Keys up to the northern edge of Miami-Dade County, but in the 1940’s the invention and ensuing widespread use of the rock plow marked the destruction of the majority of Floridian pine rockland. Today, only a fraction of the original Miami pine rockland habitat remains; by some estimates as little as 2%. Moreover, most of these remaining areas are quite small and often widely separated by miles of heavy development. In addition, many of these remaining pine rocklands now face a new danger; due to the lack of fire, they are being overrun by both native and non-native vegetation as the habitats are transitioning to hardwood hammocks. Shortly after my arrival in Miami, Barry and I are on the road, heading to survey a potential habitat. Unfortunately the most promising area, within a neighborhood park, was an overgrown mess of vines and small hardwood trees. This turns out to be the norm; while we visit several potential habitats, they too are all overgrown. It was evident that vegetation had been growing unchecked for years and no attempt at maintaining these habitats had been made. We next head to the site where C. scabrosa var floridana was first rediscovered. This area, along with several other parcels of land, is bordered on one side by a highway while a large development wraps around the other sides. Despite this encroachment there remains a sizable area of pine rockland which, thanks to controlled burns, is in exceptional condition. An open patch of sand, ideal habitat for C. scabrosa var floridana; notice the charred remnants of a tree on the ground. Barry and I weave through the clumps of saw palmetto toward a sandy exposure and we pause at the edge. Before long there is a hint of movement and a small tiger beetle darts from the base of a blade of grass towards the center of the sandy patch. Its coloration is unique; it is dark, not black, but rather a deep iridescent bronzy-green hue. We inspect several other patches and see a fair number of beetles; the temperature is over 90 degrees and the beetles are very active. Most are moving in and out of the sparse patches of shade or sporadically about the sandy areas, occasionally darting after an ant. Trying to photograph one is particularly difficult; not only are the beetles fast and small, but there are also jagged chunks of limestone sticking out of the sandy ground making it difficult to move about. On my hands and knees, I slowly approach a beetle but it flies off. Again I approach a beetle; it also takes flight. At last I come across a more cooperative beetle and manage a couple quick shots before it also darts away. The next day Barry and I set out to survey another promising site; this one borders the area where C. scabrosa var floridana was rediscovered. We do notice some suitable habitat, but most of the ground is covered with a layer of pine needles from the dense canopy. For over an hour there is no trace of the beetles; at last we find a more open area near the edge of the trees.As we walk through the low vegetation, first Barry and then I see a flash of movement, as if a tiger beetle were taking flight. However, neither of us get a good look and only when we spot a stationary beetle are we sure of what we saw. After this exciting find we drive to the second site where floridana was rediscovered. This property sits next to the first site and has also been maintained by controlled burning. But, on the portion of this property bordering the development, there is a considerable amount of encroaching vegetation which threatens to choke out any exposed sandy areas. The last time it was burned was clearly several years prior to our survey and, as one might suspect, we found no beetles in this area. Moving on, Barry and I find a larger patch of habitat and soon catch sight of more beetles. Here the ground is quite rocky and the saw palmettos are tightly packed, so I am unable to get a decent chance to photograph the beetles in their habitat. I settle instead for a few shots of some beetles which Barry nets as we continue the survey. This form is small, with a body length under 1cm. As it comes closer to mid-afternoon we wrap up the survey and I begin to prepare for my return; though very short, this trip has been particularly productive. My flight leaves Miami International as the sun sets, my goal reached – I have the pictures I hoped for. Over the past couple of years, Barry has worked along with Brzoska and Slotten in examining several differences between this form and the closely related members of the C. abdominalis complex. Based on morphological, seasonal, and distributional differences, C. scabrosa var floridana has been elevated to a full species, Cicindela floridana, in a soon to be published paper. A side-by-side comparison of the four species of the C. abdominalis complex (L-R): C. floridana, C. scabrosa, C. abdominalis, C. highlandensis. A captive C. floridana showing the vivid green color, reduced maculations, and bright red abdomen. While the populations appear to be stable, this species requires more research and management; particularly, the remaining habitats must be sufficiently maintained. Controlled burns should be regularly conducted, as they are the first and most critical steps toward control of the encroaching vegetation. With proper care and protection this species, can come to thrive again. Special thanks to Barry Knisley for facilitating my trip to Florida and providing the specimens for the captive and comparative photograph. Also thanks to Art Evans for assistance in accessing the USNM collection. Choate, P.M. 1984. A new species of Cicindela Linnaeus (Coleoptera: Cicindelidae) from Florida, and elevation of C. abdominalis scabrosa Schaupp to species level. Entomological News 95: 73-82. Pearson, D.L., Knisley, C.B., Kazilek, C.J. 2006. A field guide to the tiger beetles of the United States and Canada. Oxford University Press, New York 8 + 227pp. Perhaps the single largest collection of tiger beetle images on the web, the group Cicindelephilia on flickr boasts an impressive nearly 1,400 images from over a hundred members. With images from all over the world this collection of photos has everything from the ordinary to the exotic – some eye candy for all tiger beetle enthusiasts so go check it out! Ted has a neat little article on the variation in tiger beetle burrows – its well worth a look – check it out!